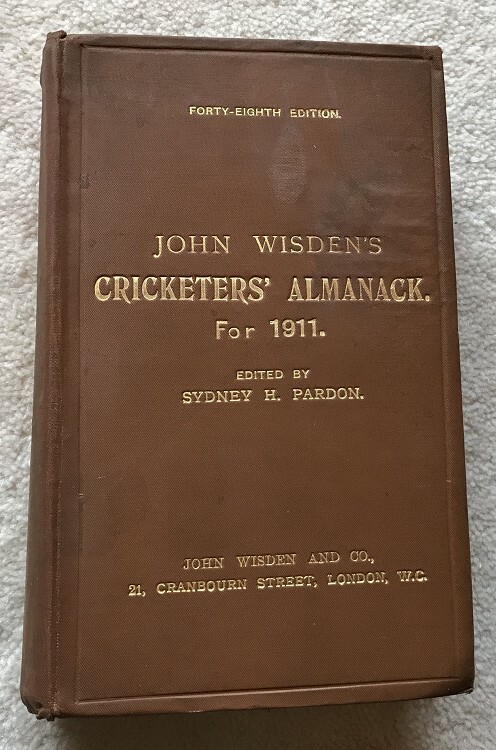 This lot is an 1911 Wisden Hardback. In OK Condition at a fabulous price. The front board has bright gilt but a couple of large marks as shown, the spine cloth is a touch dark and the gilt has been touched up, the rear board is fine. Inside the hinges have been repaired and hence it is tightly bound, nice pastedowns and clean pages with great photoplate. Just the boards that let it down a bit. Mint 1911s sell for £1250-£1500.